Seen in Chesapeake Bay, Maryland, maybe a promo pic. We don't know the brand of machinery next to it. I think that this same photo was posted here a few years ago. 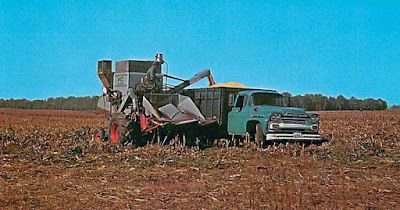 This is an early 1960s Allis-Chalmers Gleaner E Combine Harvester, with a 2-row corn head. 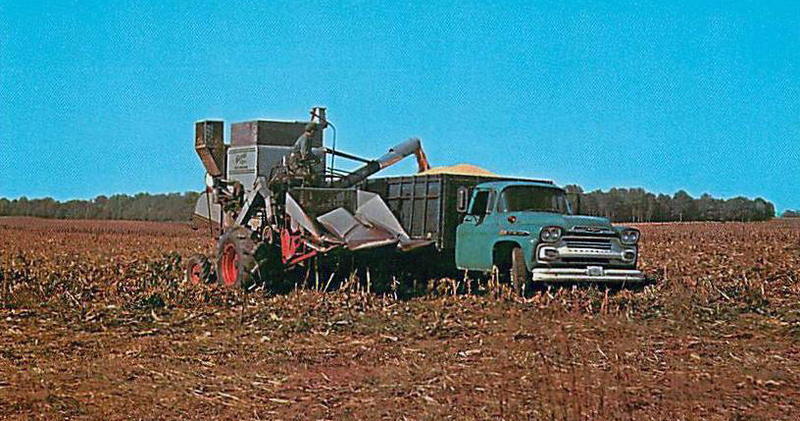 Over 17,000 Gleaner E models were built between 1962 and the end of its production in 1969. The Gleaner Manufacturing Company began building self-propelled combine harvesters in 1923, and soon gained a reputation for reliability. The company was named after the famous painting "The Gleaners" by Millet. Allis-Chalmers bought Gleaner in 1955, and Deutz AG (KHD) bought the AC farm machinery division in 1985, continuing the Gleaner under Deutz-Allis. Deutz-Allis executives purchased the North American operations of the company in 1990 and formed AGCO (Gleaner-Allis Corporation). Today AGCO produces the Gleaner S.